These socks are the complete antithesis of what’s been happening round here lately. They worked up in a speedy fashion and by only have the motif up the front. I made a mistake on the first sock and blithely carried on knitting, got to the rib and realised I should’ve had two motifs going round the ankle. So, super express they were. Now there is a story as to why I used addis and dpns. 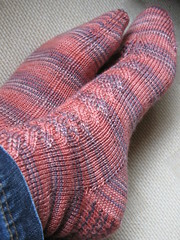 Well, I got all the way through sock #1 magic loop – brilliant! Loved the technique, so easy and much better for little hands that like to fiddle and practise their ‘knit knit’ with the real thing when I accidentally leave it in reach! So, I don’t even get through the rib on sock #2 and my needle snaps right at the join. As you can imagine I was rather miffed. I have been meaning to contact them directly as the shop I bought them from sadly closed down last summer. Has this happened to any of you?